This religious Renaissance tapestry "Madonna del Cardellino II" shows the work of Raffaello Sanzio (1483-1520). Otherwise known as Raphael, this master artist from the Renaissance produced beautiful works, many of which are inspired by religious figures. Madonna Del Cardellino means Madonna of the goldfinch. Here we see the Madonna with the Christ child and an angel. He uses the pyramidal structure of composition when depicting the holy family. There are fine haloes above the heads of these three figures to signify their holy auras. The background is a meadow of flowers, trees and a lake. 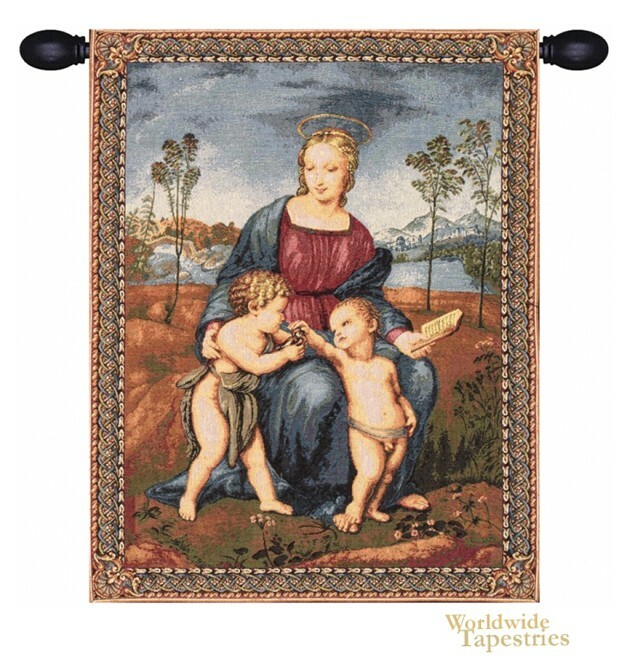 This religious tapestry "Madonna del Cardellino II" is lined and has a tunnel for easy hanging. Note: tapestry rod and tassels, where pictured, are purchased separately.